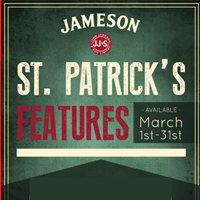 Eschelon Experiences has partnered with Jameson to provide unique St Patrick’s day themed offerings at all six of our restaurants. While St Patrick’s day is celebrated on March 17th, our guests are in luck because our features will be available the entire month. A $25 St Patty’s Flight gives guests three 1oz. pours of Powers, Redbreast 12, Green Spot. Also available is a $9 “Buy the Drink, Keep the Mug” promotion featuring a Jameson Black Barrel Mule. Give the gift of great food by purchasing a gift card to any one of Eschelon’s many restaurants. Cards can be purchased in increments of $25. Interested in attending a wine dinner or a guest chef pop-up dinner at one of our restaurants? Buy tickets today to reserve your spot.